in the Legislative Assembly of Assiniboia by Hon. Auguste Harrison. Initially, Charles Nolin seems to have been slated for the position of councillor, but after a series of disagreements with Riel he was jailed (about 4 March 1870) and held for a time. Auguste Harrison replaced him. See “Political Arrests,” New Nation (11 March 1870), 2. Auguste is sometimes confused with his father and identified as Thomas Auguste Harrison. Note: Ste.-Anne/ Oak Point is not to be confused with either St. Ann’s/ Poplar Point or Oak Point/ St. Laurent/ Manitoba/ Manitobah on the shore of Lake Manitoba. 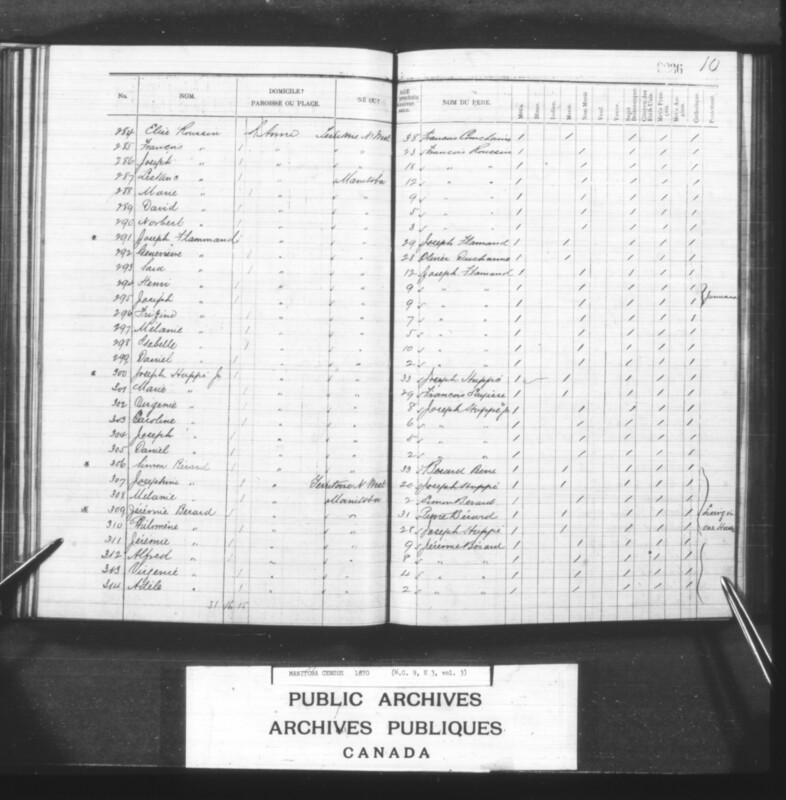 As early as 1820 Métis families were wintering at Pointe-des-Chênes, southeast of St. Boniface on the Seine River. The area had a mix of mature forest and grasslands suitable for farming. The large oak groves served as a source of income for the settlers — lumber cut in the parish in 1820 was used for building a large chapel at St. Boniface. 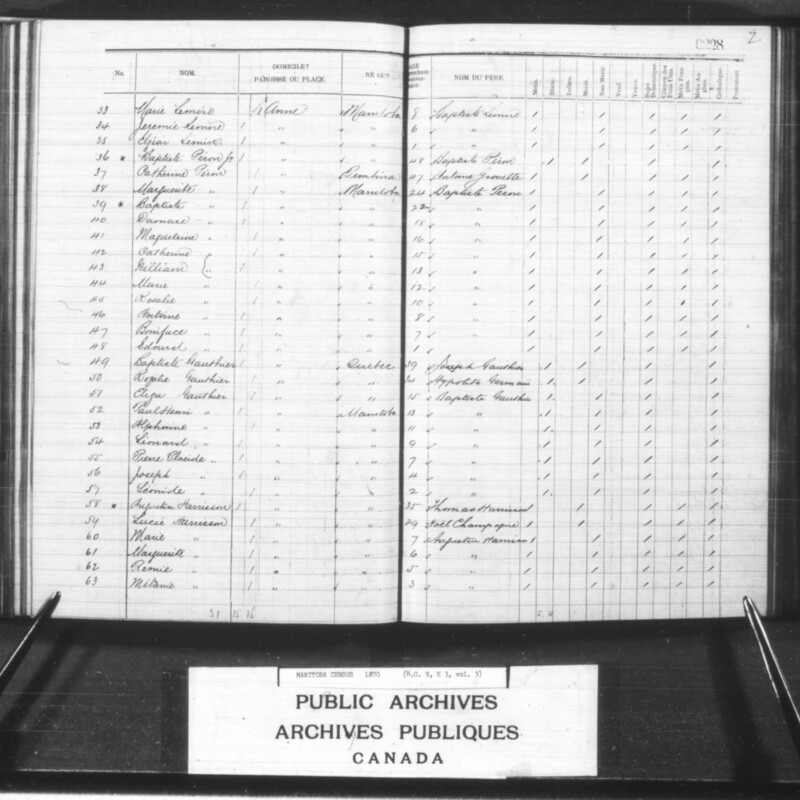 By 1852 a sizable settlement had been established that included both original Métis settlers and newcomer individuals and families. That year, the people at Pointe-des-Chênes entered into a formal purchase agreement with Saulteaux Chief Na-sa-kee-by-ness/ Na-sha-ke-penais/ ‘Flying Down Bird’/ Grandes Oreilles (son of Les Grandes Oreilles) of the Oak Point Nation, Rouseau River Band, at his insistence, to accommodate further expansion. By 1856 Pointe-des-Chênes had a trading post, hotel, general store, and a jail. Oblate missionaries from St. Boniface began visiting the settlement in 1859 (they did not yet establish a residence there). A Catholic mission with a chapel – St. Alexander – opened in 1861 (still without a resident priest). 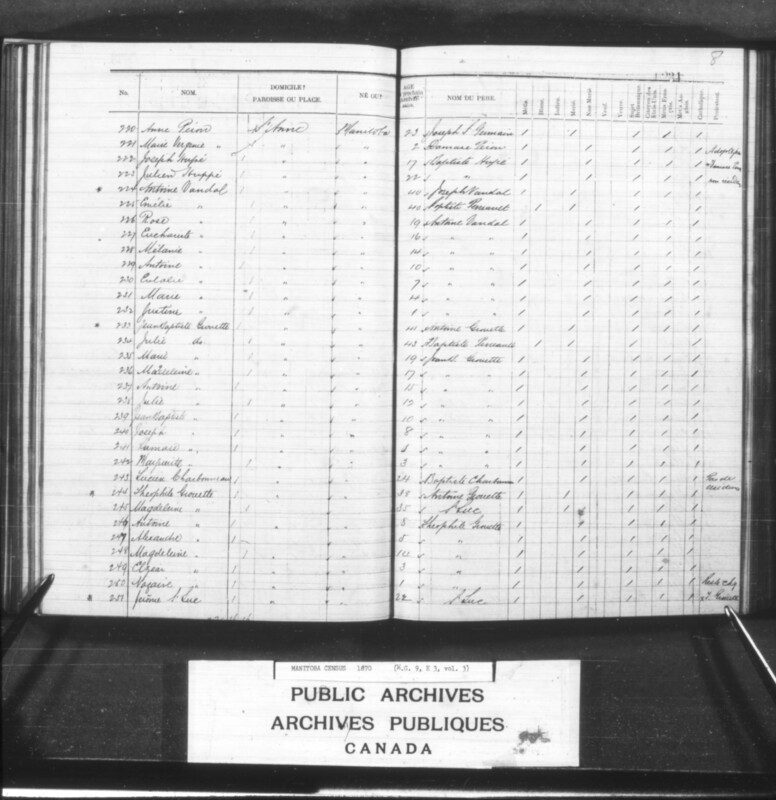 In 1862 Rosalie Germain, wife of Jean-Baptiste Gauthier (both of whom had arrived from Lower Canada), began teaching school. In 1867 Father LeFloch petitioned Bishop Alexandre-Antonin Taché to rename the mission’s parish in the hopes of attracting additional settlers from Lower Canada and it became known as Sainte Anne, after the patron saint of Quebec and Canada (as well as much else). John Allan Snow arrived at Red River to oversee the construction of a road to Canada — the Dawson Trail — in 1868. It was to be approximately 145 kilometers long, running from St. Boniface, through Ste. Anne to the North West Angle of the Lake of the Woods, after which the ‘road’ would consist principally of waterways that linked to Fort William (on the western border of Canada). Work began on 9 November 1868. Forty-five kilometers of road were cleared by 1 April 1869, but work ceased while Snow returned to Ottawa to ask for more funds. The money was granted. However, when Snow arrived back at Red River in July, he had difficulty hiring workers. Men native to the settlement were already employed at farming and working for the HBC. 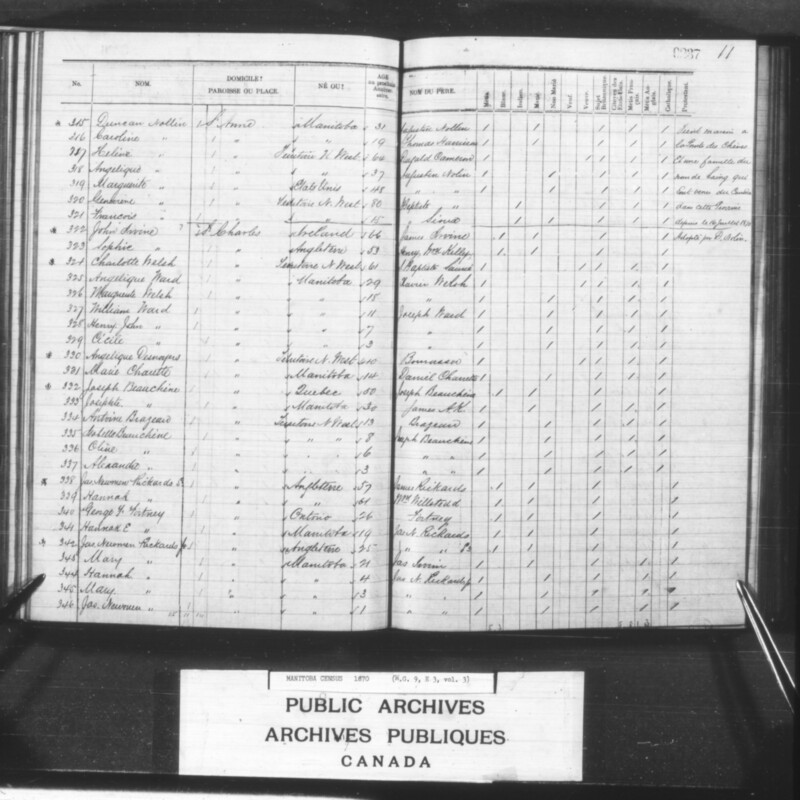 Snow therefore relied on newly arrived Canadian labourers, along with survey crews brought in by Canadian surveyor John Stoughton Dennis, but these were annoying to the permanent residents of Red River: “rumours of misconduct by Snow’s party were widely circulated and pretty generally believed,” especially after some — including Thomas Scott — were arrested and tried for assault. Work on the road ceased during the Resistance. There were stories that the Canadians were actually soldiers and that Canadian Lieutenant-Governor designate William McDougall was bringing in rifles and ammunition to arm them. 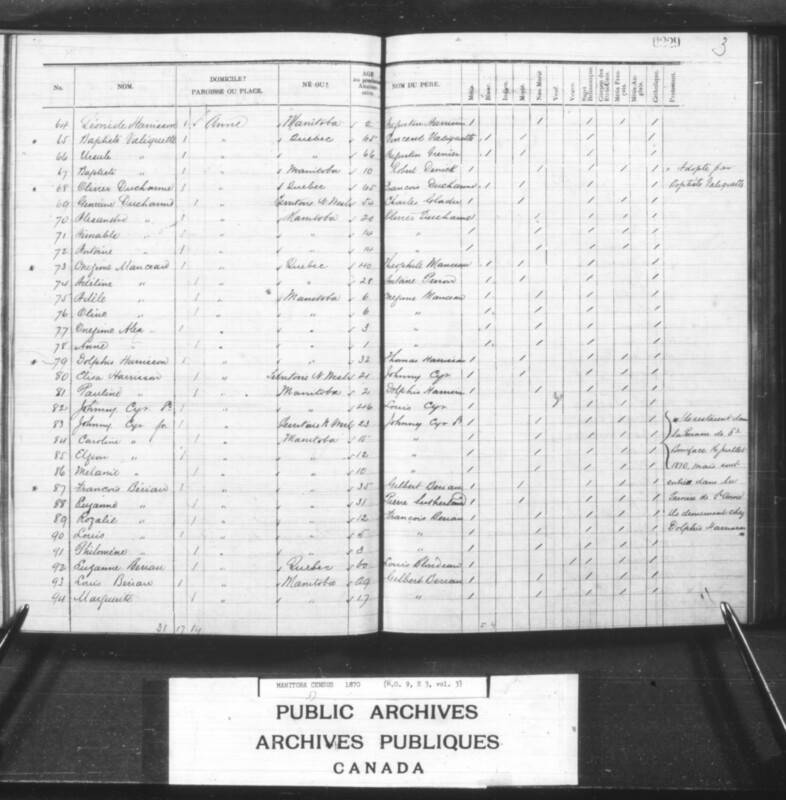 Some Canadians went so far as to form a militia and were arrested and jailed [see Prisoners, this site]. An Oblate priest finally took up residence in the parish in 1870. The Dawson road was eventually completed in 1871. The Town of Sainte-Anne was incorporated in 1963. – [302-305] Virginie 8, Caroline 6, Joseph 5, Daniel 2. –  Marie Veronique/ Virginie 2. 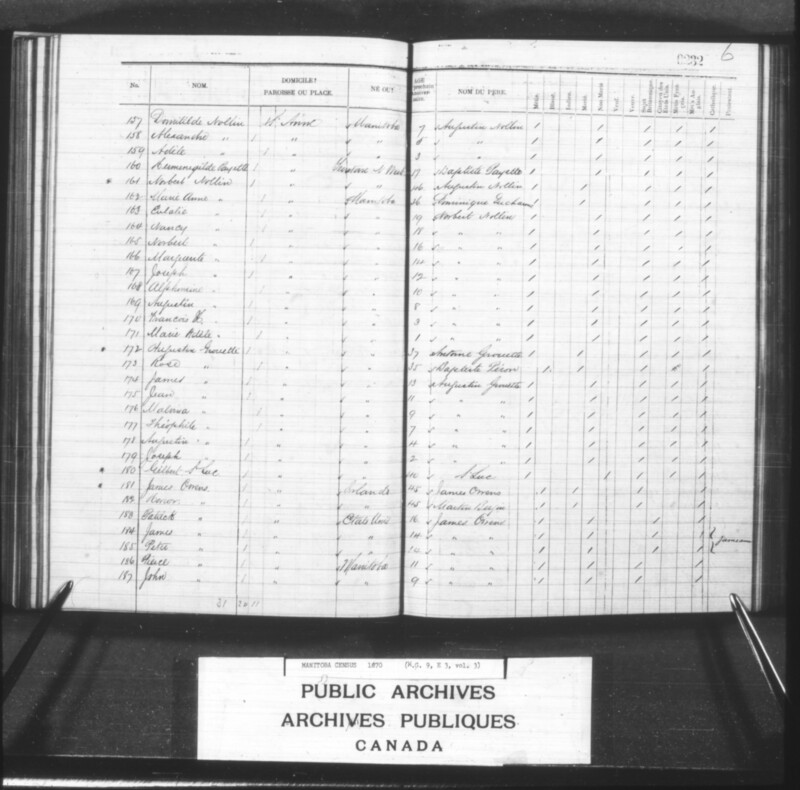 [216-217] Baptiste Peron/ Perreault dit Morin (Lower Canadian, born 1798 to Joseph Peron and an unidentified woman) married Marie Charron-Ducharme (Lower Canadian, born 1803 to Francois Ducharme and an unidentified woman). 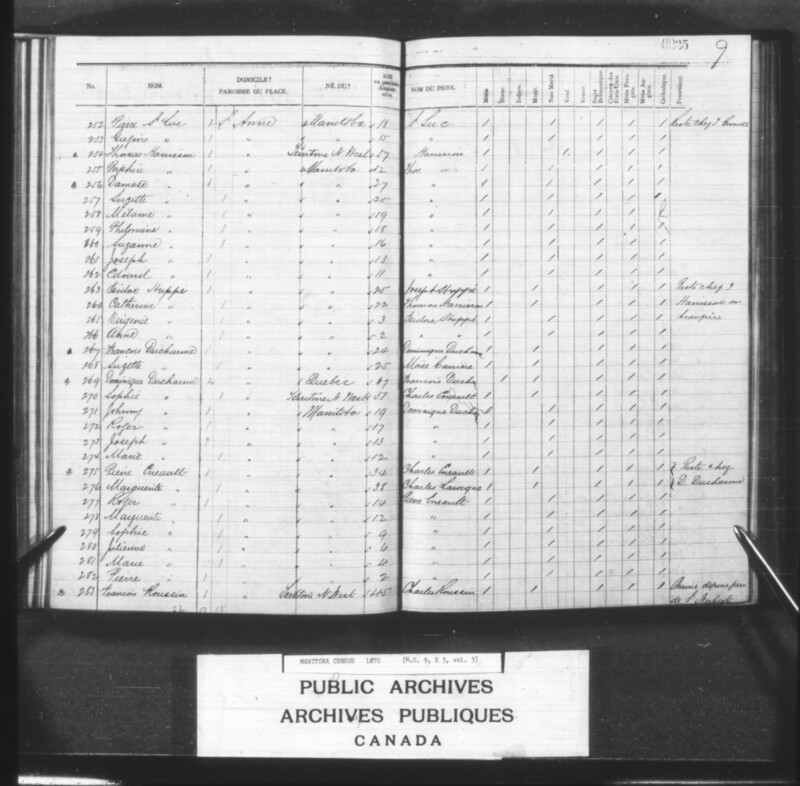 [96-97] Francois St Luc de Repentigny (Métis, born 1836 to #4609 Gilbert St Luc/ “St. 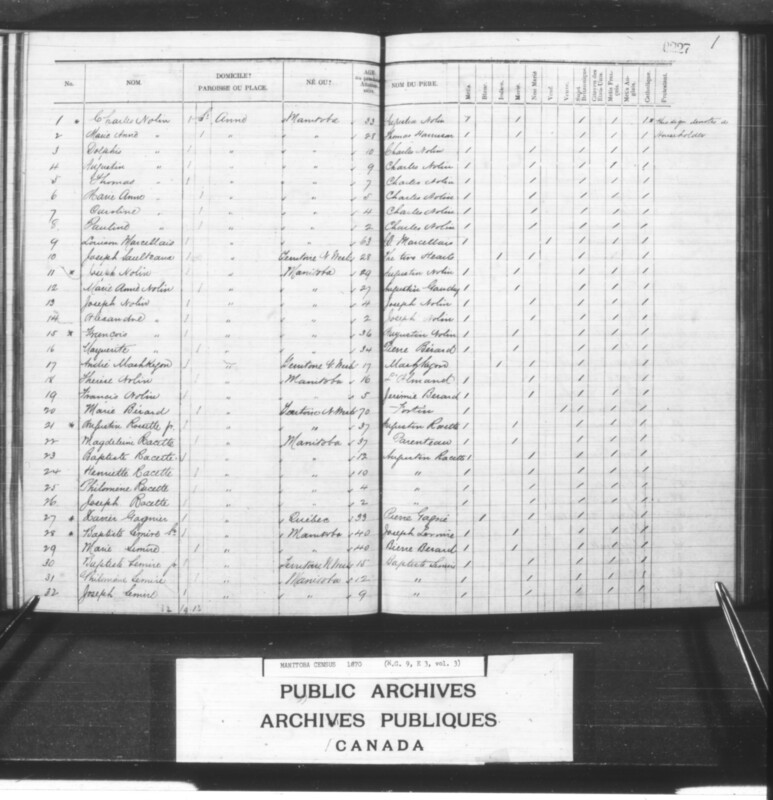 Luc D’Arpentigny a French Canadian” and Catherine Boucher — Métis), married to Marie Beriau/ Bariault (Métis, born 1847 to Gilbert Beriau/ Beriault and an unidentified woman). – [211-213] Baptiste 15, Veronique 13, Joseph 3. – [206-208] Antoine 6, Alexandre 4, Joseph 1. – [127-133] Francoise 12, Pierre 11, Alexandre 10, Marie 8, Edouard 5, Frizine 3, Dominique 1. –  Josephte 26/ Suzette 28. A farming family. See also genealogy. – [139-140] Mary 2, James 0/ 2. – [143-145] Martha 20, Robert 18, Thomas 14. – [148-149] Marie 3, Azilda 1. – [195-202] Octave 21, Julienne 19, Eucarise 17, Sara 15, Anargile 12, Marie 9, Pierre 6, Olivier 3. – [183-187] Patrick 16, James 14, Peter 14, Pierce 11, John 9, [188-190] Martin 7, Marguerite 5, Joseph 1. 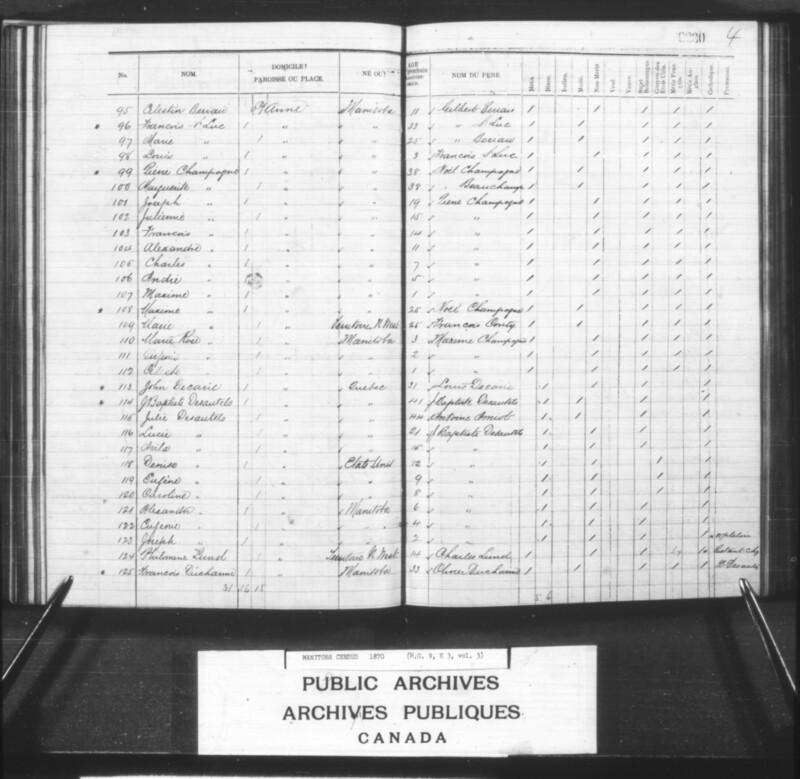 Possibly Angelique Comtois (Métis, born 1848 to Francois Comtois [Lower Canadian] and Marie Angelique Saudway [First Nations])? – [174-179] James 13, Jean 11, Malvina 9, Theophile 7, Augustin 4, Joseph 2. – [163-171] Eulalie 19, Nancy 18, Norbert 16, Marguerite 14, Joseph 12, Alphonsine 10, Augustin 8, Francois H. 3, Marie Adele 1. – [318-319] Marguerite 48, Angelique 37. – [153-156] Marguerite 18, Joseph 15, Francois Xavier 13, Joachim 10, [157-159] Domatilde 7, Alexandre 5, Adele 3. – [226-232] Rose 19, Euchariste 16, Melanie 14, Antoine 10, Eulalie 7, Marie 4, Justine 1. – [235-242] Marie 19, Magdeleine 17, Antoine 15, Julie 12, Jean-Baptiste 10, Joseph 8, Damase 5, Marguerite 3. – [246-250] Magdeleine 4/ 14, Antoine 8, Alexandre 5, Elzear 3, Nazaise 1. – [255-262] Porphire 32, Damase 27, Suzette 25, Melanie 19, Philomene 18, Suzanne 16, Joseph 13, Edouard 11. NB. 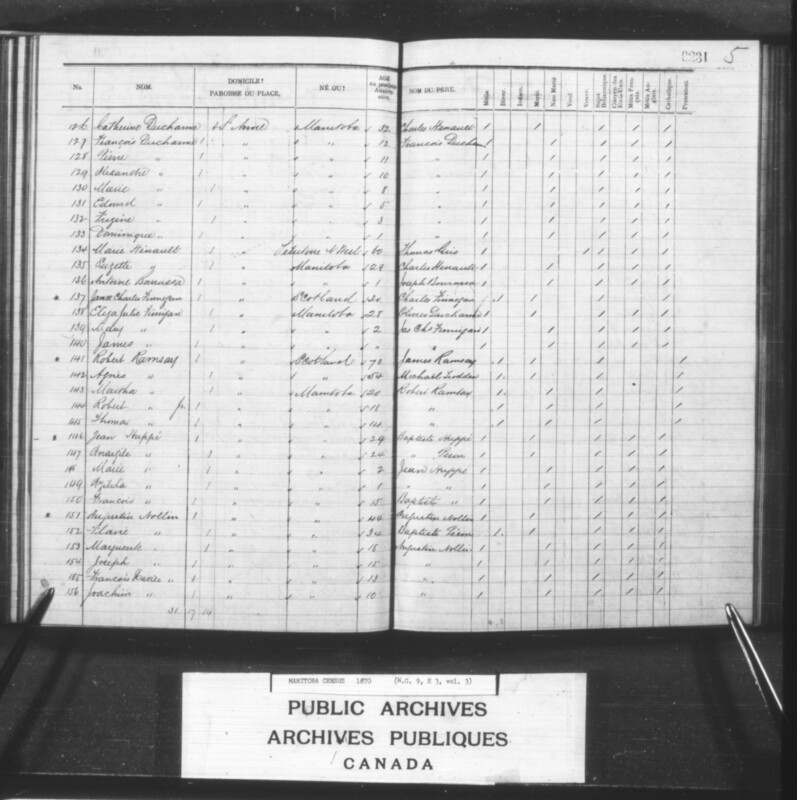 Damase Harrison was married to Helene Matte (born 1845) and living at Lorette? with infant Henri? – [271-274] Johnny 19, Roger 17, Joseph 13, Marie 12. – [285-290] Francois 23, Joseph 18, Lestanc 12, Marie 9, David 5, Norbert 3. – [277-282] Roger 14, Marguerite 12, Sophie 9, Julienne 6, Marie 4, Pierre 1/ 2. – [311-314] Jeremie 9, Alfred 8, Virginie 4, Adele 2. – [293-299] Sara 12, Isabelle 10, Henri 9, Joseph 9, Frizine 7, Melanie 5, Daniel 2. – [3-8] Dolphis 10, Augustin 9, Thomas 7, Marie Anne 5, Caroline 4, Pauline 2. – [13-14] Joseph 4, Alexandre 2. – [23-26] Baptiste 12, Henriette 10, Philomene 4, Joseph 2. – [30-32] Jean-Baptiste 15, Philomene 12, Joseph 9, [33-35] Marie 8, Jeremie 6, Elzear 1. – [38-48] Marguerite 24, Baptiste 22, Damase 18, Magdeleine 16, Catherine 15, William 13, Marie 12, Rosalie 10, Antoine 8, Boniface 7, Edouard 1. – [51-57] Eliza 15, Paul Henri 13, Alphonsine 11, Leonard 9, Pierre Placide 7, Joseph 4, Leonide 2. – [116-123] Lucie 21, Avila 15, Denise 12, Eugene 9, Caroline 8, Alexandre 6, Eugenie 4, Joseph, 2. – [70-72] Alexandre 20, Amable 14, Antoine 14. 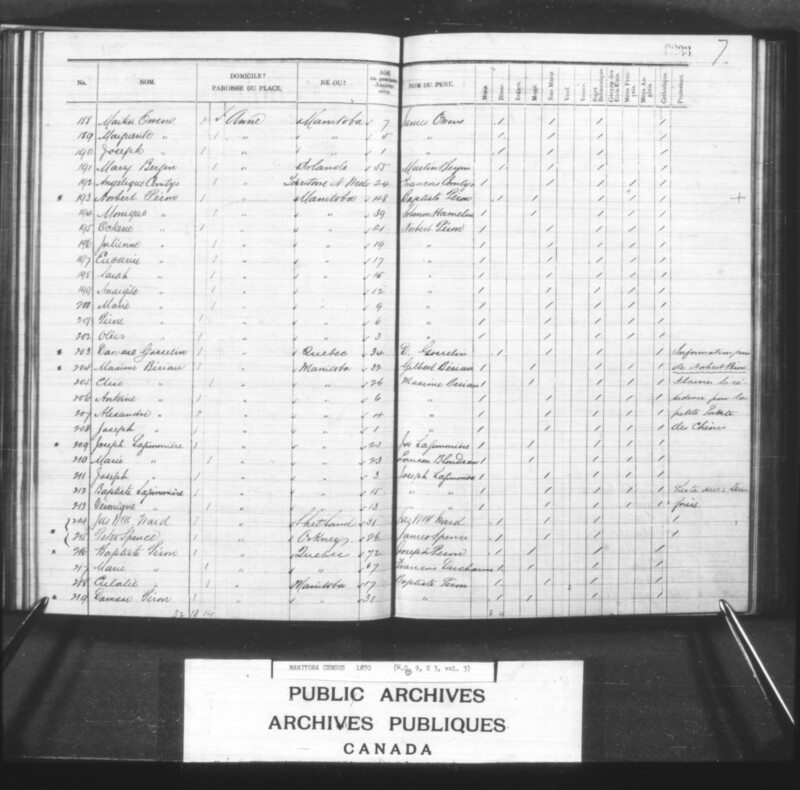 –  Baptiste 10 (Métis, son of Robert Denick and an unidentified woman). – [75-78] Adele 6, Olive 6, Onezime 3, Anne 1. – [265-266] Virginie 3, Anne 2. – [89-91] Rosalie 12, Louis 5, Philomene 3. – [93-94] Louis 29, Marguerite 17,  Celestine 11. – [60-63] Marie 7, Marguerite 6, Remie 5, Melanie 3,  Leonide 2. – [101-107] Joseph 19, Julienne 15, Francois 14, Alexandre 11, Charles 7, Andre 5, Maxime 1. – [110-112] Marie Rose 3, Virginie 2, Celeste 1. – [83-86] Johnny Jr. 23, Caroline 15, Elzear 12, Melanie 10.